This was the last local council by-election before the bumper crop of contests on 22 May. And it was a Tory win. Or more accurately, a Tory hold. Roman Bank is a safe ward for the Conservatives that they were never going to have difficulty in retaining. What’s more significant, perhaps, is how Ukip pushed Labour into third place, meaning that overall the election saw a swing from Labour to Conservative of 5.2%. I’m going to be documenting all the local by-elections between now and the general election next year. They’re useful, if tiny, snapshots of how the parties are faring at absolute ground level. They’re also handy for showing how opinion may or may not be shifting in those parts of the country that will be key to deciding the outcome of the general election: the 100 or so crucial marginal seats. This week’s by-election in Cambridgeshire wasn’t in a marginal, nor did it alter the complexion of the local council. Fenland district council is among the safest Tory fiefdoms in England, with the party holding 34 of its 40 seats. (The other six being shared between two independents, two “truly independents” and two of the “Liberal Democrat Alliance”). But the result does allow for a bit of trend-spotting. The Press Association has done a handy analysis of the 14 local by-elections since the Budget on 19 March. It calculated that the average share of the vote, based on eight wards fought both times by all three major parties, puts Labour on 34.6%, the Tories on 31.3% and the Lib Dems on 19.2%. And taking all 14 contests together, Labour has a projected nationwide lead over the Tories of just 0.3%. All of which sets the scene rather nicely for later this month, when we’re due not just one actual result, but one thousand or so. 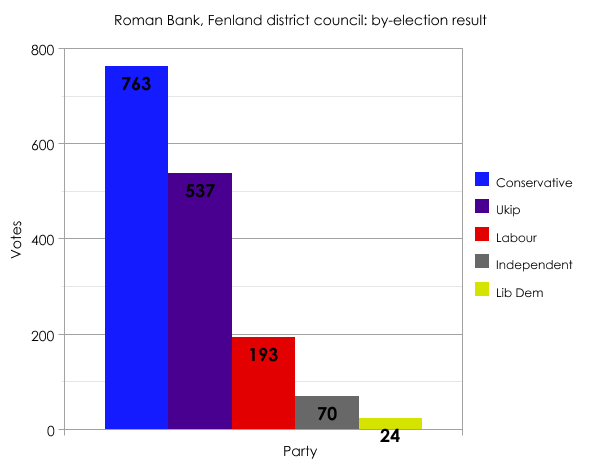 Note: vote shares in Roman Bank were CON 48.1% (-8.8); UKIP 33.8% (+33.8); LAB 12.2% (-14.5); IND 4.4% (+4.4); LIB DEM 1.5% (-14.9).